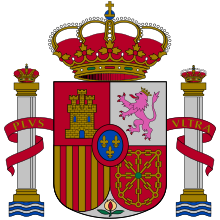 Spain (Spanish: España [esˈpaɲa] ( listen)), officially the Kingdom of Spain (Spanish: Reino de España), is a country mostly located in Europe. Its continental European territory is situated on the Iberian Peninsula. Its territory also includes two archipelagoes: the Canary Islands off the coast of Africa, and the Balearic Islands in the Mediterranean Sea. The African enclaves of Ceuta, Melilla, and Peñón de Vélez de la Gomera make Spain the only European country to have a physical border with an African country (Morocco). Several small islands in the Alboran Sea are also part of Spanish territory. The country's mainland is bordered to the south and east by the Mediterranean Sea except for a small land boundary with Gibraltar; to the north and northeast by France, Andorra, and the Bay of Biscay; and to the west and northwest by Portugal and the Atlantic Ocean. Ceuta is an autonomous city of Spain located on the Mediterranean, on the North African side of the Strait of Gibraltar, which separates it from the Spanish mainland. Ceuta, together with the other plazas de soberanía including the African autonomous city of Melilla and a number of Mediterranean islets, is claimed by Morocco. The area of Ceuta is approximately 28 km². Ceuta is dominated by a hill called Monte Hacho, on which there is a fort occupied by the Spanish army. Monte Hacho is one of the possible locations for the southern Pillars of Hercules of Greek Legend, the other possibility being Jebel Musa. Ceuta's strategic location has made it the crucial waypoint of many cultures' trade and military ventures — beginning with the Carthaginians in the 5th century BC, who called the city Abyla. It was not until the Romans took control in about A.D. 42 that the port city (then named Septem) assumed an almost exclusive military purpose. Approximately 400 years later, the Vandals ousted the Romans for control, and later it fell to the Visigoths of Hispania and the Byzantines. In 710, as Muslim armies approached the city, its Byzantine governor Julian (also described as "king of the Ghomara") changed sides and urged them to invade the Iberian Peninsula. Under the leadership of Berber general Tariq ibn Ziyad, Ceuta was used as a prime staging ground for an assault on Visigothic Hispania soon after. Antonio Gala (born 2 October 1936) is a Spanish poet, playwright, novelist and writer. Gala was born in Brazatortas, Ciudad Real (Castile-La Mancha), although he moved very soon to Córdoba and is widely considered an Andalusian. A graduate in law, philosophy, politics and economics, he has written in a wide variety of genres, including journalism, short stories, essays and television scripts. He has been awarded several prizes, not only within the field of poetry but also for his contributions to theatre and opera. Gala's work has been more appreciated by his readership than by the critics, who find it hard to classify it due to its particular blend of lyricism and epic. Among his most successful plays are Los verdes campos del Edén (The Green Fields of Eden, National Theatre Prize "Calderón de la Barca" 1963), Anillos para una dama (Rings for a Lady, 1973), ¿Por qué corres, Ulises? (Why do you run, Ulysses?, 1975), Petra Regalada (1980), Samarkanda (1985), Carmen, Carmen (1988) and La truhana (The rogue, 1992). Among his collections of poetry are Sonetos de La Zubia (La Zubia Sonets), Poemas de amor (Love Poems), Testamento Andaluz (Andalusian Will) and Enemigo íntimo (Intimate Enemy, Adonais Prize 1959). ...that, besides Spanish, other languages such as Catalan, Basque or Galician are spoken in Spain? ...that the modern name Spain comes from Hispania, the name given by the Romans to the whole of the Iberian Peninsula? ...that, in the 8th century, nearly all of the Iberian Peninsula was conquered (711-718) by Muslim armies of Moor origin from North Africa?